It’s official: 2015 was the hottest year on record. The US-based National Oceanic and Atmospheric Administration has confirmed overnight that 2015 saw the global average temperature climbing to 0.90°C above the 20th-century average of 13.9°C. The record has been confirmed by the UK Met Office. It’s been only a year since the record was previously broken, but 2015 stands out as an extraordinarily hot year. 2014, the previous hottest year, was 0.74°C above the global average. December 2015 marks the first time in the NOAA record a global monthly temperature anomaly has exceeded 1°C - it reached 1.11°C. Every month since February 1985 has been warmer than average, and 2015 is the 39th consecutive year with above-average annual temperatures in an uninterrupted run that began in the mid 1970s. Ten months in 2015 beat previous records for those months. The evidence that the so-called “global warming hiatus” is over is compelling – if it ever existed. Air temperatures over the land rose markedly to a new record of 1.33°C above average, and ocean temperatures also reached a new record anomaly of 0.74°C in 2015. The global ocean has absorbed up to 90% of the excess heat retained or accumulated by human activities since the industrial revolution, and ocean temperatures show clear warming trends both at the surface and deep down. 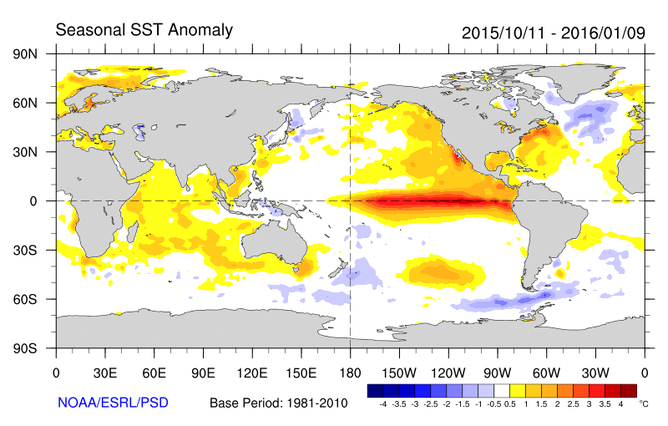 In 2015/2016 a strong El Niño event is bringing some of that heat buried in the ocean back to the surface. Global temperatures are influenced by both natural and human factors. 2015 saw the development of an El Niño event classed as one of the three strongest on record, comparable to those of 1982/83 and 1997/98. These events are linked to higher global air temperatures. Since 1850 many of the warmest years have also been El Niño years. El Niño events are driven by changes in the winds across the Pacific Ocean, which move warm water from the western Pacific to the east. In 2015 central Pacific sea surface temperatures were more than 3°C above average over an area of approximately 5.5 million square kilometres, around 70% of the size of the Australian continent. Air temperatures increase during El Niño events as heat is transferred from the ocean to the atmosphere. But a strong El Niño event alone is not sufficient to account for the 2015 record temperature anomaly. In May 2015 carbon dioxide concentrations reached a monthly value of 403.9 parts per million (ppm) - the highest ever recorded. 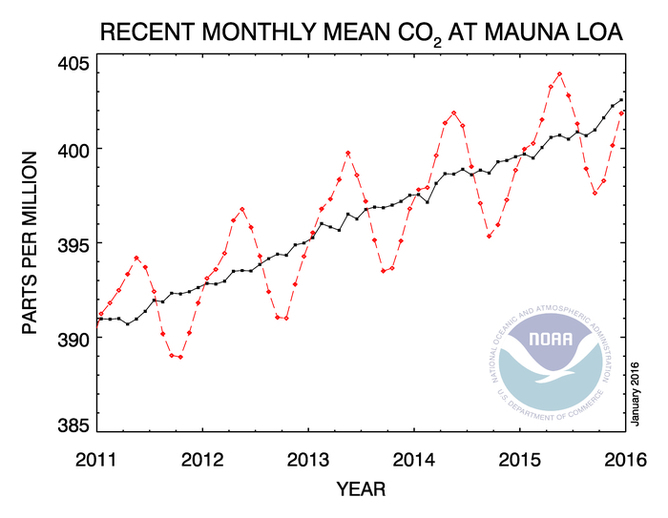 The average concentration of CO₂ in 2015 may exceed 400 pppm for the first time in human history. CO₂ is the one of the principal greenhouse gases responsible for human-induced global warming. Since 2008 the CO₂ concentration has increased by an average of 2.1 ppm per year, largely due to fossil fuel and land-use emissions, emphasising the significant impact of human activity on the atmosphere. CO₂ concentrations now exceed pre-industrial levels by more than 40%, and the likelihood of this increase and the associated warming being due only to natural factors is vanishingly small. Across the globe 2015 was characterised by weather and climate extremes from floods and severe storms to droughts and heatwaves. In Australia climate conditions are being pushed beyond our historical experience of natural climate variability and into new territory. Global warming has increased the likelihood of record-breaking temperatures by up to 100 times. In 2015 records were broken once again across Australia, in a series of high temperature events particularly in Western Australia (January), Queensland (March), and the south-eastern states (October, November and December). The Bureau of Meteorology 2015 Annual Climate Statement highlights October as particularly noteworthy. 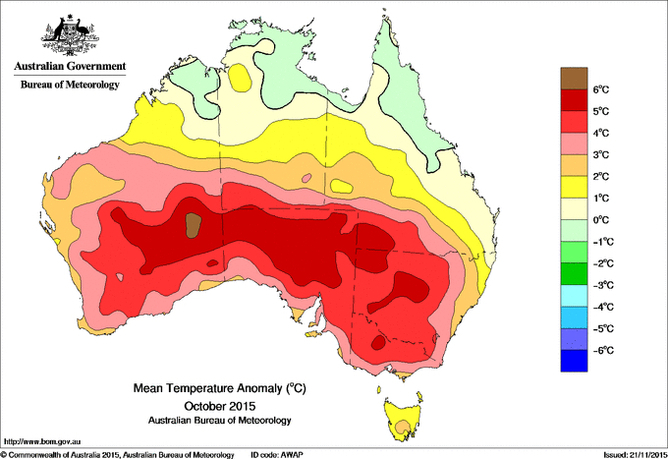 October 2015 was 2.89℃ warmer than the average October inn Australia. While this doesn’t make October the hottest month overall (that title still belongs to the summer months), it is the largest margin by which a monthly record has ever been broken. High temperatures broke the internet (literally); led to cancelled sporting events in Victoria and South Australia; and added to severe bushfire conditions in several states. In response to concerns about this ongoing warming and the associated heat extremes, the wine industry is exploring adaptation options including changing grape varieties; cereal crop, fruit, vegetable and milk producers are trying to reduce the impact of heatwaves and droughts on yields; and we need to change our behaviour and infrastructure to deal with the health impacts of more extreme temperatures and more frequent heatwaves. We are all affected by global warming. The climate and weather impacts of 2015 in Australia are examples of what is happening around the globe, adding to the overwhelming body of evidence of the reality and impacts of global warming. The combination of a strong El Niño event with ongoing human-induced warming of the ocean and atmosphere set up the conditions for 2015. It is unlikely to be the last such record. El Niño events are part of natural climate variability and will continue to occur, and until greenhouse gas emissions are reduced at least in line with the Paris Climate Agreement global temperatures will continue to rise for the foreseeable future. As agreed by the governments of the world at the Paris UNFCCC meeting, the need for effective and urgent local, national and global action to reduce emissions has never been more pointed.